Thank you SO much for this! And I’m glad that your scare was nothing to be concerned about. yes, Yes, YES! I rarely pray for me because I am blessed, so how can I ask for more? Also, sometimes it feels selfish and I taught myself to do for others first (and second and third). And finally, even though He forgives my sins, I don’t always, so how can I ask my Father for something when I KNOW I don’t deserve it. And I echo Robin’s sentiment: so glad to hear you’re well, relatively speaking. Love that song, too. A really good one for these moments. I hear what you are saying about praying—but Jesus said to pray about everything. That includes you :-). I believe we can ALWAYS ask for more of God, to know Him more deeply, to praise Him for what He’s already done—even if we’re not asking for anything else. Thank you for your ongoing encouragement. You are such a blessing to me. Perfect timing & your words are a super blessing to me. My husband & I are waiting for more test results, etc. about how the oncologist will guide him as to the next treatment option. He’s had 3 yrs after IL-2 treatment before this distant met showed up 2 mo ago. He was diagnosed 3 1/2 yrs ago with stage 4 kidney cancer with metastasis. Of course we pray for complete healing, but our doubt has its grip on us. Thank you Kelly for your honesty & transparency. You are a gift to many! Chris, saying a prayer for you and your husband as I type this. Lord, let them feel your presence. Let them know your healing power. Let them see You in every moment, hear You in the words that are spoken, breathe You in with each breath they take. Unlike some people, I don’t think doubt is bad—in fact, I praise You for the times of doubt because You have always used them to strengthen my faith. Use this time to reveal Yourself more fully to Chris and her husband. Yes, Lord, we ask for healing. But more than anything, we ask for You to be with them, to be with me, to be with all of us. To somehow lead us and carry us through. To somehow comfort and strengthen and encourage us. To be the Almighty, Omniscient, Omnipotent One. We praise Your name! Amen. you know my thoughts on this subject. thank you for sharing yours. no fear or doubt will keep God from loving us and hearing our prayers. we may need to be reminded of this on a daily, hourly, minute by minute basis. but, it is the truth! God’s truth. I read in my bible today and underlined this portion of matthew 14:36, “and all who touched him were healed.” I’m resting in this today. I don’t always get past, “heavenly Father” either. I believe God knows what is on our hearts and what we are trying to convey to Him. “Heavenly Father” is like my touch at the hem of his clothing. He knows what I am asking for before I can form the words and He heals. Praise God for that! It’s hard for all of us to be consistent, to keep working at having a close relationship with Him. I don’t know why, but it is. 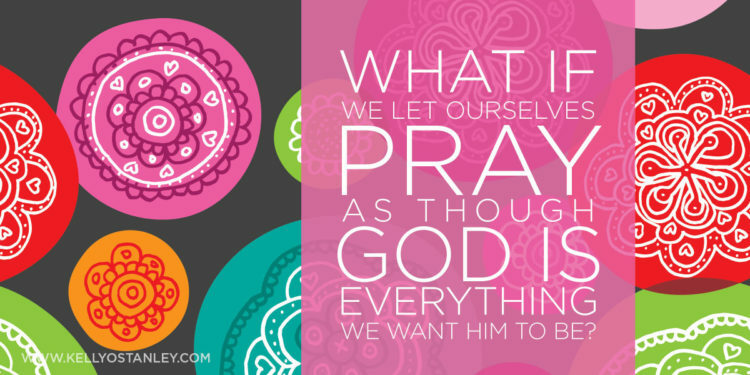 But I believe that one prayer He ALWAYS answers is when we pray to be closer to Him. I want to encourage you to keep trying, to give yourself grace and forgiveness when you fall short, and I hope that you start seeing God in everything you do. Because He is there with you, always.